On 31 May Israel and Syria signed an agreement to cease fire, separate their armies on the Golan Heights and repatriate wounded and other prisoners-of-war held by either side. In accordance with the terms of the agreement the Security Council immediately set up a UN Disengagement Observer Force (UNDOF) to supervise the implementation of the agreement for an initial period of 6 months. The 1200-man force became operational on 6 June. By 26 June 1964 the four phases of the disengagement agreement had been completed smoothly and on schedule and the new UN force had taken up positions in a buffer zone extending from Mt. Harmon in the north to the Jordanian border in the south. The force is made up of some 90 observers from the UN Truce Supervision Organization (UNTSO), which has been serving in the area since the truce of 1948, and some 500 Austrians, 350 Peruvians and 250 Canadian and Polish logistics personnel formerly serving with the UN Emergency Force (UNEF) established in October 1973 to observe the cease fire between Israel and Egypt and supervise the disengagement of forces agreement reached by those two countries in January 1974. Lt. Col. 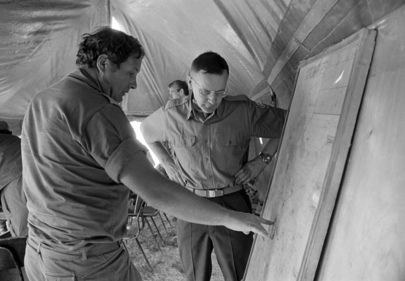 Carry Gal (right), S.I.R., Northern Command, Israeli Armed Forces, explaining Israeli positions to Maj. Gen. Lauri Koho, Military Liaison Officer, Offices of the UN Secretary-General, during his visit to UNDOF forward headquarters at Han Arnabe.